TV fanatics don’t have to suffer summer withdrawals anymore because the warm days are filled with exciting new and returning shows. For extensive lists of all summer has to offer, you can head over to TVLine and Eonline. But let’s be real, no-one has time to watch 40+ shows over the summer. So, to make your life easier, I’ve picked a smaller more manageable list of “must watchs”. This mini list includes new and returning shows that go from sci-fi to period drama. So you can have a bit of everything. Here are TVRepublik’s top 5 picks for 2015 summer (ordered by premiere date). Mark your calendars! Hannibal is an odd TV case. The general consensus amongst people who watch it is that it is “brilliantly exquisite” and “too good for broadcast TV”. Yet, it never gets the attention [or the ratings] it deserves and has been criminally ignored in all major award shows. However, the show enjoys a passionate cult-following [with amazing fanart BTW]. Fortunately, someone at NBC has recognized its value and the show is still around for a third season of masterful visual storytelling. Due to the radical changes in setting and premise, Bryan Fuller (executive producer) believes Season 3 is the perfect entry point for new viewers. And I certainly encourage everybody to at least “sample” this show. After watching one episode you’ll understand why everyone claims it is so special. I’d even go as far as saying Hannibal is not TV [not HBO either], it is art. If nothing else, you’ve got to give it to BatB for being a survivor. This underdog show has been on the verge of cancellation since S1. Not one prediction site believed it could make it past S2, yet the little show that could managed to make a somewhat successful transition to summer and have a much more successful run in the international/online markets. As a result, it not only scored a S3 renewal, but also a Season 4 [And, no, I have not ruled out the possibility of an abbreviated S5 yet]. Finally finished with Beauty and the Beast on Netflix. I'm looking forward to the new season! There is still time to catch up before the S3 premiere, but even if you can’t I’d suggest you get on board! 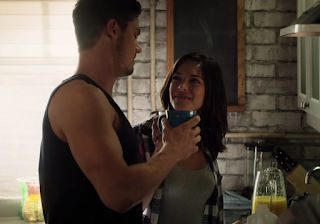 Much like Hannibal, BATB’s third season has a new premise, new setting, new threats. So, new viewers are welcome! All you need to know is thatBatB revolves around Vincent (the beast), a doctor and former soldier who was the victim of a failed military experiment; and Catherine (the beauty), an NYPD detective whose past is linked to Vincent in more ways than one. If you love science fiction and have a soft spot for love stories [even if you don’t like to admit it like myself], this show is the perfect addition to your summer watchlist. If you are a new viewer planning a Netflix binge-watch or just want to relive all the best moments here are all S1 and S2 recaps. Stay tuned for the BATB ultimate wishlist ahead of the premiere + the day after (US airing) recaplette. Speaking of romance… the new British import sure has loads of it. I started watching this show, simply because it was on and I had nothing else to watch. I was expecting the run of the mill British period drama and I was ready to give it up after a week. However, Poldark surprised me and kept my undivided attention for the entire season. That’s not to say Poldark doesn’t have drama. High society politics, speculation wars, mortal epidemics, gun duels and more will pack the first season of this thoroughly enjoyable show. Plus it introduced one of my new favourite female characters of the season and defied quite a few "genre" conventions. Reminiscent in many ways of Downton Abbey, Poldark is a worthy soon-to-be-imported-hit. Fine, I’ll be honest. The only reason I started watching this show is because Gregory Smith (Everwood) was on it. It was originally marketed as “Grey’s Anatomy with cops” and I couldn’t help but roll my eyes at that. However, here we are, five years later and I have concluded it is a fair comparison. The writers may not have that extra something something Shonda Rhimes and her team have, but they do a pretty good job. The episodes juggle multiple characters and storylines. It is a work-place drama that emphasises the human aspect of the characters, it has a lot of heart, tender moment and occasional shocks. So, in many ways, yes Rookie Blue is similar to Grey’s. This Canadian drama is the show you don’t expect to love but do. I am not a die-hard fan, I don’t follow the news about it and I am not particularly involved with the fandom. But every year I get excited when I realize it is time for it to come back. And I think, unlike many shows, it’s actually gotten better with time. Now… is this show friendly to new viewers? I am not sure. We are 5 seasons in and, unlike Batb and Hannibal, Rookie Blue didn’t have a “premise reboot”, so it will rely heavily on the pre-established relationships. Having said that, there will be new characters and new storylines, plus it has a procedural (case of the week) element. So I think it is possible for new viewers to jump in at this point. It may take them a few episodes to figure out who is sleeping with whom but it can’t be that hard. This show has all the ingredients to become my new obsession. Dystopian future society CHECK, a dark look at consumerism CHECK, intriguing mythology CHECK, stars from other cult-hits I loved CHECK. I’ve been following this show since production was announced last year and it has already generated some behind the scenes drama. Channel 4 and Kudos were originally coproducing the show with a division of Microsoft which was eventually closed due to cutbacks. The fate of the show was up in the air for a while until AMC came to the rescue. Humans is set in a parallel universe [not far removed from our own] where the latest “accessory” are synths AKA humanoid robots. By the looks of it, the show will focus on the moral and emotional implications on both the “real humans” and the artificial lifeforms. It sounds all sorts of amazing. In addition, we have some familiar faces like William Hurt (Damages), Colin Morgan (Merlin), Gemma Chang (Sherlock, Fresh Meat). It is one of the new shows I am anticipating the most this year. I hope it can somehow fill the void left by Almost Human and Utopia. [Fingers crossed]. Also coming this June the new season of Orange is the New Black, The Astronaut Wives Club [could be similar to Manhattan maybe?] and sci-fi Mr. Robot [which might be awesome… or terrible, can’t tell yet]. The new season of So You Think You Can Dance is already airing on FOX. And this is just for June! July and August are also packed with good TV. Too much to watch, too little time indeed! Humans is amazing so far! Definitely worth the wait. Hope America likes it as much as the UK does. It's always trending here and has broken its channel's previous ratings. I am absolutely loving Humans as well. After ep 2 was over I got that "I need to watch the next ep NOW" feeling. Humans TV series is based on our Swedish TV show 'Äkta människor/Real Humans' and the Swedish original version was great (but in Swedish) so 'Humans' is a remake. I was indeed aware of that, I have not watched the original, unfortunately.